Vikings and other Norse warriors were well-known for their attempt to emulate the fury and prowess of animals, and this Viking Wolf Helmet is likely an attempt to channel the power of the wild wolf, creating a berserker-warrior blessed by Odin. 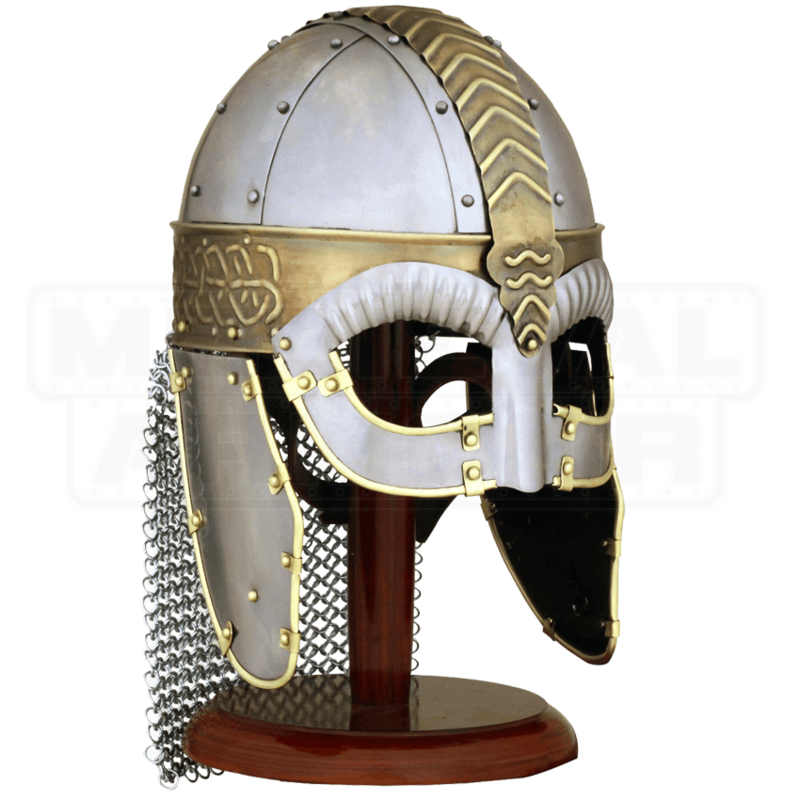 Impressive in its overall scope and detail, this helmet echoes the look of a more traditional Viking helmet, but with a few stylized touches that only enhance its appeal. The helmet is a composite skull cap, made in 18 gauge steel, which features darkened brass accents across the middle-line of the skull and around the brim. Celtic line patterns and knots adorn these ornate accents, while a steel face-plate covers the warriors eyes, masking part of his face behind a ridged brow that is touched with polished brass accents. Hinged cheek protectors hang down from the sides of the helmet, while a mail curtain adorns the back, for added defense. The interior of the helmet features a liner and a chin strap as well, for easy and comfortable wearing. The helmet stand is not included, but can be purchased separately (item AH-3813). For a Norse style that will send your foes running in terror and fear, you need to look the part of an authentic Viking Warrior, and nothing will suit that style better than this Viking Wolf Helmet.